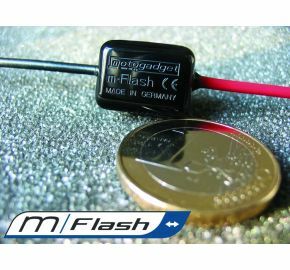 The m.Flash and m.Wave are by far the most compact load independent blinker relays on the market. Nothing comes close in size and simplicity! They substitute all conventional blinker relays. The m.Wave offers an additional smooth fade in and fade out feature for your blinkers. Ultra compact and light - in essence just a piece of cable attached to a tiny, candy-sized device. The wiring can be placed into the handle bar or frame tubes or into the wiring harness. Almost load independent (1 - 100 Watt). Completely implemented using digital semiconductor technology. Consistently constant and correct blinker frequency. Suited for almost all LED blinker lights, all micro and halogen blinker. Also works with 4 mixed blinkers or 2 handlebar end blinkers. Immediate loss free and brighter illumination of all blinkers. Utterly hassle-free connection using only two cables - just connect in series. Completely water tight and vibration resistant because of the molded-in construction.